I am so excited Festival is next week, I can hardly wait! Although, I really do need time to pack, you have no idea how much teachers have to bring. Thank you Southwest for 2 free bags! Even though it's a ton of work to prepare for, Festival is the highlight of my year, I love it! Gorgeous work to see, loads of inspiration, fun shopping, reconnecting with great friends, awesome events and classes, it's just the best! Those of you who still haven't been, you really should find away to get there one of these days, you won't be disappointed. 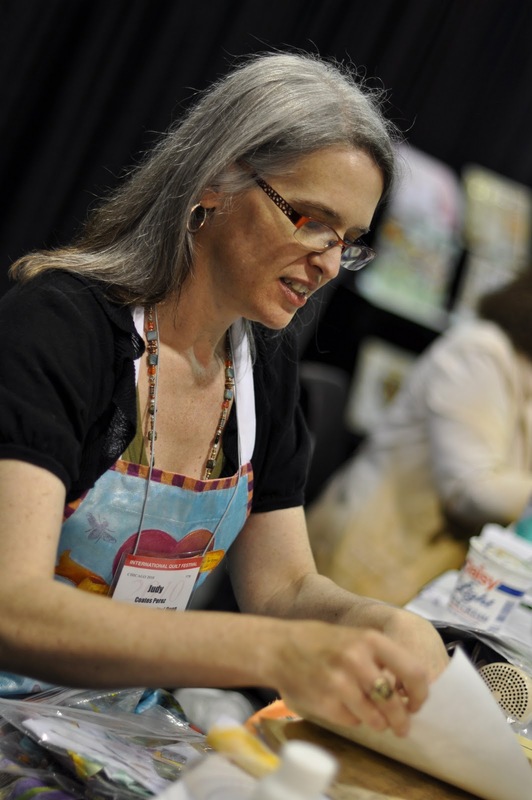 Here's a rundown of my teaching and demo schedule at Festival. then for the grand finale, dance until we drop at Gala on the Green at 7 pm! Woo hoo, too much fun! If you see me at festival, please stop and say hi, I love meeting my blog readers. In between getting ready for Houston next week and the necessities of daily life, I have been trying to get in a little time for making art by painting some Fiesta Ornaments. My good friend Frieda, put in an order with me for Christmas, so I need to get crackin and finish these up. I will probably be embossing them on the plane to Houston. 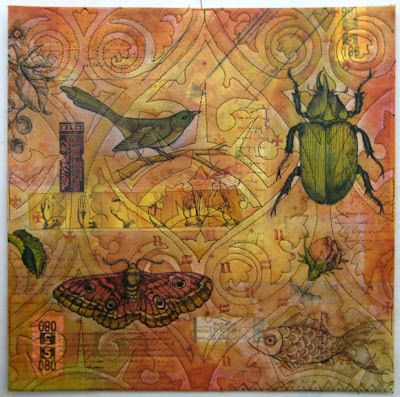 Check out this great article about Kelli Perkins, the mixed media fiber artist we all know and love! Wow, I just got my first review of my new DVD and I haven't even seen it yet! The DVD arrived last night. WELL DONE! You sounded and looked fabulous, confident, and well at ease. 1. Where do you get your titanium needles? What a good idea. 2. What's your favorite wool batting? 3. I've only ever found my Jacquard and Setacolor paints in small jars, maybe 2-4 ounces. I have this inkling that getting the paint out of those small jars and into squeeze bottles would in and of itself be excessively wasteful - there's just not that much there to begin with. Am I barking up the wrong tree? Are you starting out with bigger jars of paint? First off, I want to say thanks for the great review!!!!!!! I think I am my own worst critic. These are great questions, that I know others will want to know the answers to as well. 1. The titanium needles are made by a Japanese manufacturer named Organ. They can be found online with a google search or sometimes you can find a vendor at Quilt Festival or Superior Threads. Superior has made a deal with Organ to sell their titanium needles under their brand name. 2. My favorite batting is Hobbs heirloom. If you buy it in a bag, the batt can get pressed into flattened wrinkles, to get the fibers to relax, fluff up and regain their loft, you will need to lay it out flat and spritz it with water or if you have a hand held steamer you can run over the top of the batt a few inches above the surface and it will fluff right up. The other option is to buy it by the yard off the bolt from a quilt shop that carries it or directly from Harriet Hargraves shop it is wrinkle free if you do that. 3. I go through a lot of paint, so it doesn't always make sense for me to buy little jars. I like to buy the basic colors in larger sizes from either Blick or Dharma Trading and transfer them to boston round plastic bottles with screw tops. When you have paint leftover paint in the jars after pouring all you can into plastic bottles, you can add a little water to the jars, shake them up and pour several complimentary colors on a peice of fabric, scrunch it up a little on top of plastic sheet and let it dry. For added effects throw some rock salt on a piece of wet painted fabric and let it dry. The next day iron it with a press cloth on top and enjoy! Jennifer from Canada left a comment on my felted pumpkin post asking about the stitching on the skulls so I thought I would post a few close ups to show how I stitched mine. I think one could really do any kind of colorful stitching and they would look great. 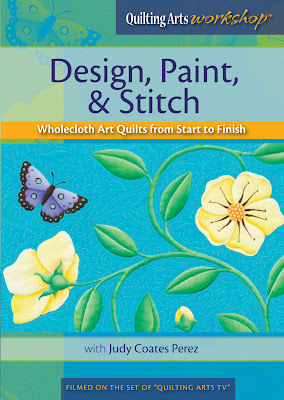 Interweave has just posted a preview of my new DVD Design, Paint & Stitch. You have no idea how hard it is to watch yourself on these things, lol! Add paint to your quilt with an array of painting techniques! 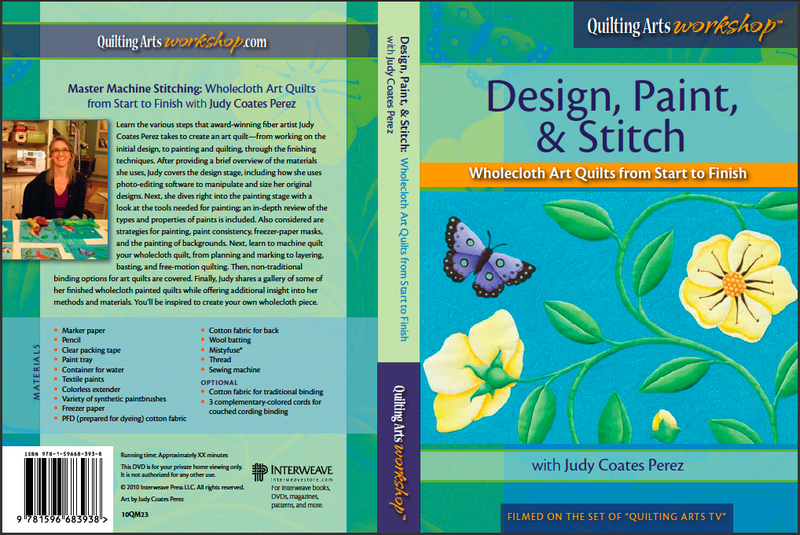 Learn the various steps that Judy takes to create an art quilt—from working on the initial design, to painting and quilting, through the finishing techniques. Can't wait? Also available in download! 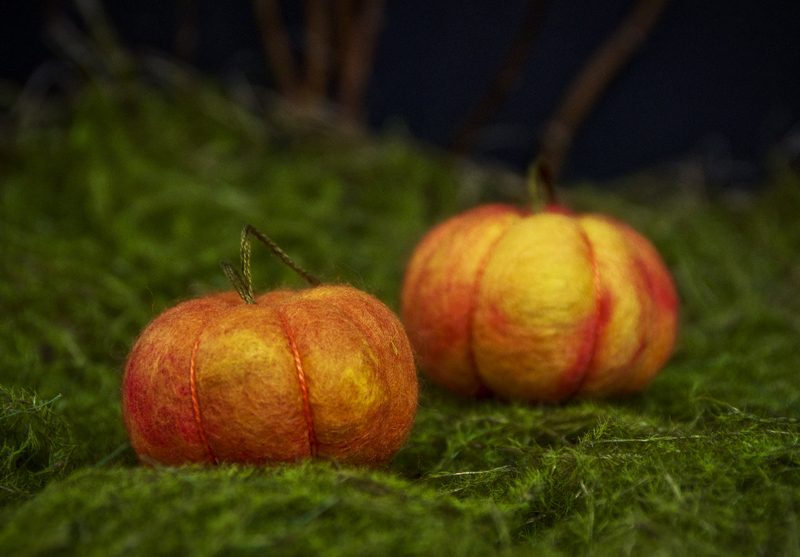 To make felted pumpkins you will need: wool roving, yarn, pantyhose, embroidery floss, embroidery needle, and scissors. You can also make little day of the dead skulls too, by making white felted balls adding black felt eyes and stitch nose, mouth and decorative designs like flowers and x's with colorful embroidery floss. By the way, one of my favorite sources for wool roving is Outback Fibers. Check out Alma Stollers new tute on making a tie. 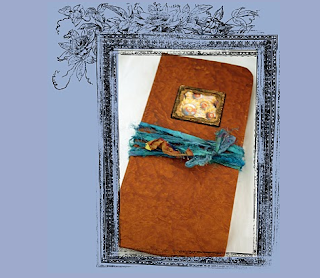 Check out Tracie Lynn Huskamps new tutorial on adding nature to your journal. Several months ago I scoured the internet looking for directions on how to cut plexiglass when I wanted to make some stamps and had such a hard time finding good instructions. 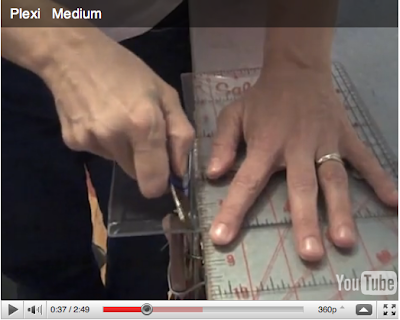 Melly Testa has a great tutorial on cutting it with directions to make your own foam stamps. Have you ever wanted to make beaded fringe? Lyric Kinard has a great step by step tutorial, check it out. I keep thinking that I am almost ready for International Quilt Festival in Houston, when I realize there is so much more to do. It would be nice to have some time for art making, but right now it is all about putting kits together, and getting organized for Open Studios. I am doing something new this year in Houston, I am participating in the Mixed Media Miscellany on Thursday, Nov. 4 from 2-4 pm. I will be demonstrating several of the techniques I used working with tea bags as a medium for collage, like I used in this piece. 4 tea stained empty tea bags, 2 pages of copyright free imagery that can be traced onto teabags and a postcard with an image of my quilt for inspiration. This week, I also put together kits for my Make It University workshop on Saturday, Nov. 6 at 2:45 making the Origami Pop Up Book. I brought the book sample home with me from the Long Beach show and of course, lost it and had to make another one yesterday. Luckily, they are pretty quick to make, especially if all the pieces are cut to size and ready to go. I hope to see you in Houston. Jane is a master at the artst sketchbook journal, she has a wonderful new tutorial showing how she creates her lovely drawn and painted layered images using Golden absorbent ground. 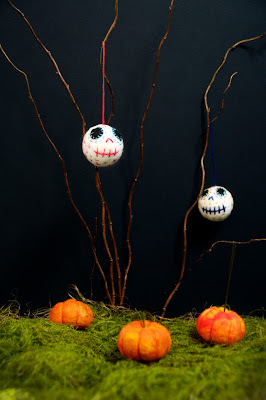 See Jane's tutorial. Really, I always feel a little shy when it comes to promoting stuff like this, it's so hard to toot your own horn, but I taped a new DVD with Interweave when I was in Cleveland last month. It is due to hit the store shelves in a couple weeks. Below is the outside cover of the dvd, if you click on the photo you should be able to see all the details. This DVD is filled with as much information and demonstrations as I could squeeze into an hour. 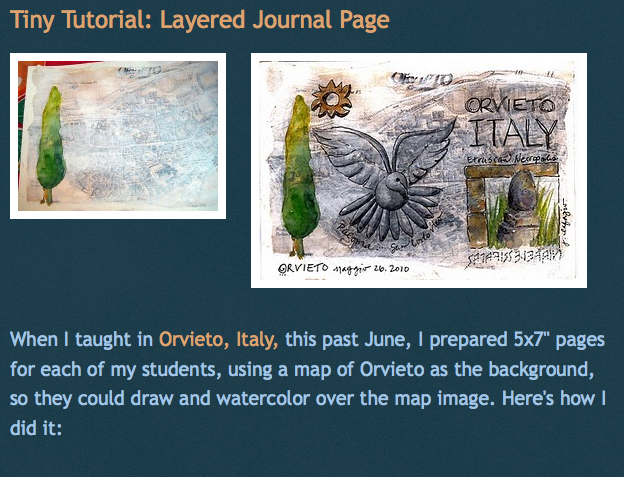 I cover a lot of the tips, tricks and products that I have found work best for me when I make art quilts. Later in the month I will do a few blog posts to supplement some of the info on the DVD. You can pre-order Design, Paint & Stitch here. With busy summer schedules a potluck feast with friends was long overdue. It started with lots of appetizers; kalmatas and green olives, hummus, lovely spicy sweet tangy peppadews, brie wrapped with puff pastry and chutney and another appetizer I threw together at the last minute from epicurious using the rest of the puff pastry filled with feta cheese and sundried tomatoes (I'll make those again! ), italian proscuitto, guacamole, salsa and chips and a good french red wine. We started to get too full from appetizers, but we managed to have a bowl of our next course, a lovely soup made with chick peas, potato and red peppers (sorry forgot to get a picture, too much wine, lol) then we were definitely too full for our main course of chili! Lucky for us it's one of those things that tastes even better the next day! yum, perfect for this chilly fall weather. Our dessert was moist and yummy pumpkin bars with cream cheese frosting, I need this recipe Megan! 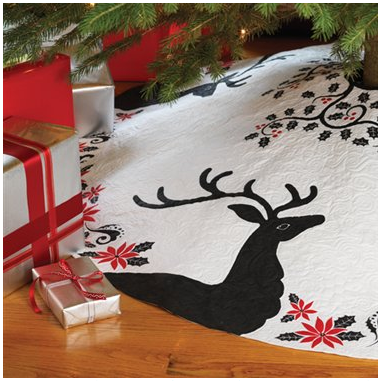 For those of you who bought the new Quilting Arts gifts magazine and want to make the deer Christmas tree skirt, there is a pdf of the pattern available for download on the Quilting Arts website, that you can print out and tape together.